. . . it is the "Second Piano Concerto" that sounds the more magniloquent, thanks to the romantic depth of Barenboim's playing and the Germanic eloquence of Barenboim's own Staatskapelle Berlin, conducted by Gustavo Dudamel. The two concertos were recorded at a single concert. The risks and rewards of live recordings are equally in evidence.
. . . a resounding success . . . [Barenboim brings a muscular tenderness to the haunting Adagio,] while the Staatskapelle Berlin is robust and responsive in the dashing Rondo . . .
. . . [this recording] conveys all the energy and buzz of a very special live event . . .
. . . magnificent things in both works . . . [Piano Concerto no. 2]: the searching account of the slow movement shows Barenboim and his orchestra at their best.
. . . the performances are masterful, emphasizing the lyric side of both works . . . Stereo sound is excellent . . . There is no musician before the public today with a more complete knowledge of the Brahms piano concertos than Daniel Barenboim . . . Barenboim's larger mastery remains, underpinned by playing that, in the D minor First Concerto at least, is close to studio quality . . . this performance is a must for Brahms collectors . . . Like all great Brahms interpreters, Barenboim gives the music space . . . The orchestra is Barenboim's own Berlin Staatskapelle, which produces a Brahms sound of rare depth and beauty under the direction of Barenboim's chosen collaborator Gustavo Dudamel. Some of the quiet playing has to be heard to be believed. Dudamel's grasp of the music's symphonic dimension is also impressive . . .
[Brahms 1 / 2nd movement]: Barenboim's piano tone becomes luxuriantly liquid as he proceeds into the brief cadenza, with gentle murmurs from Dudamel's string contingent . . . An audience who had been utterly invisible erupts into cries of joyous ovation . . . [Brahms 2]: Few performances of the "Scherzo" will successfully compete with the esteemed 1958 Gilels/Reiner inscription for virile intensity, and Barenboim eschews the purely motoric elements for a lyrical expressivity more in the manner of the late Artur Rubinstein. The realization has mass and girth, however, and Dudamel has his Staatskapelle horns and tympani in high dudgeon . . . Sonic definition for the two concertos remains focused and singularly quiet at once, a miracle of an engineering team . 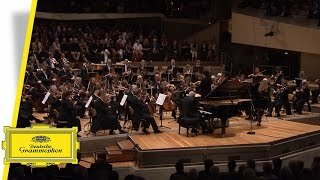 . .
Seventy-two-year-old virtuoso Daniel Barenboim as soloist with conductor Gustavo Dudamel and the Staatskapelle Berlin make this live recording an important event. I have been moved by the sense of yearning and struggle, the feeling of sheer obsessive physicality in music-making that predominate . . . [Piano Concerto no. 2]: Barenboim displays complete confidence technically and musically. Stretched-out phrases convey longing; even over-emphasizing accents in the first movement's exposition is justified by the weary climb of the melodic line. Dudamel and players equal Barenboim's expressive level and finesse, including tender passages and delicate passage work. Of many highlights I will mention one: the magnificent "starry night" suggested by single, high piano notes over hushed strings towards the Andante's end, paced beautifully by Dudamel and Barenboim. The Concerto No.1 in D Minor is also a wonderful work of large dimensions and endless inventiveness. In the first movement the pianist has chosen the most apt structural points to broaden the tempo. Barenboim's pedalling is clear throughout, including the rapid filigree passages. The slow movement is a model of expression and colour; in the finale, Barenboim and Dudamel capture well the serious rhetorical interplay within and between piano and orchestra parts.
. . . [Barenboim plays] with the energy and power a man half his age might envy. His "D Minor Concerto" is very weighty and expansive -- broad and poetic, while his "B Flat" is relaxed and stately . . . Barenboim's playing is effortlessly articulate -- every note finely shaded and perfectly placed. The orchestra sounds burnished yet clear and transparent, with excellent clarity. Brahms's piano concertos receive solid treatment in the hands of Barenboim and Dudamel. [Brahms / Piano Concerto no. 1]: Dudamel's orchestral exposition is tremendously powerful and is captured in first-rate, immediate sound . . . [Barenboim's] voice-leading is sensitive . . . The music breathes in the central Adagio and both Barenboim and Dudamel enter Brahms' world completely, with Dudamel achieving properly chthonic sounds from his lower strings . . . [in the Concerto no. 2, Dudamel is magnificently sensitive throughout] . . . The second movement is low-energy, balanced by a beautifully rapt third movement. The finale is delicate and properly Allegretto.
. . . Daniel Barenboim is at the height of his considerable powers as both pianist and conductor. These may be his last words on the Brahms piano concertos, and they reflect a lifetime of hard work and serious thought. Barenboim's protégé Gustavo Dudamel makes an ideal partner on the podium, and the Staatskapelle Berlin, Barenboim's own orchestra, glows from within. Not only the common South American roots of both artists but also the precise and energetic playing of Barenboim and the "volcanic" temperament of Dudamel make them a "Dream couple" and "The Piano Concertos" a great album.